As a historical dressmaker, I love a challenge! So, it was with great interest that I began creating a new evening gown for my client based on the key elements of her Paris original. 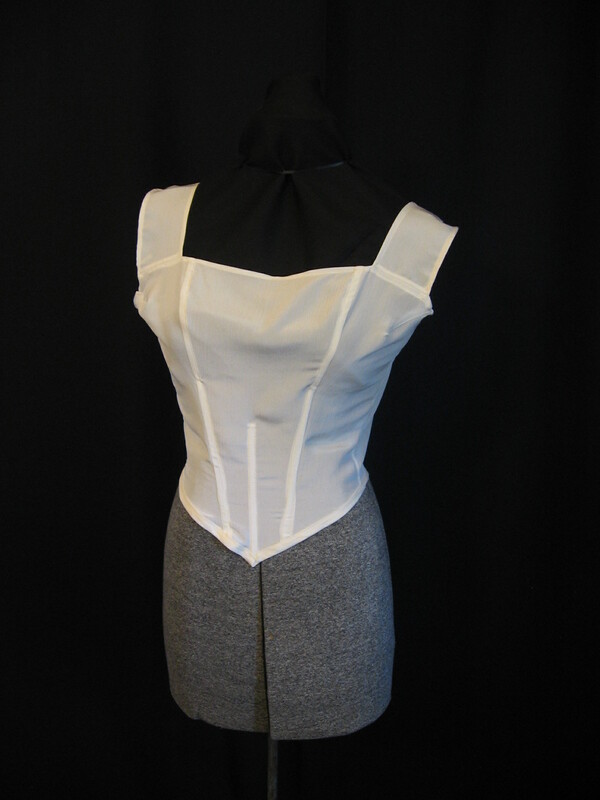 I began with the bodice lining. 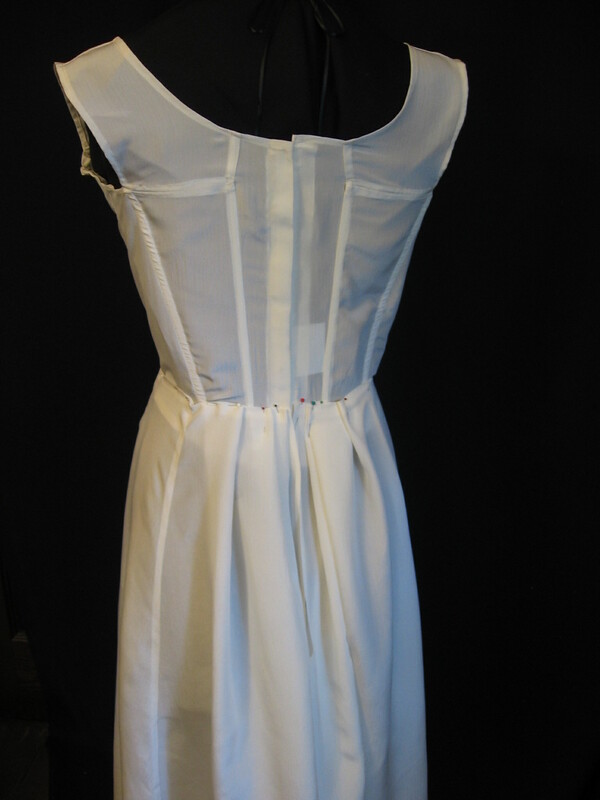 I used a fine white silk, similar to the original lining fabric. 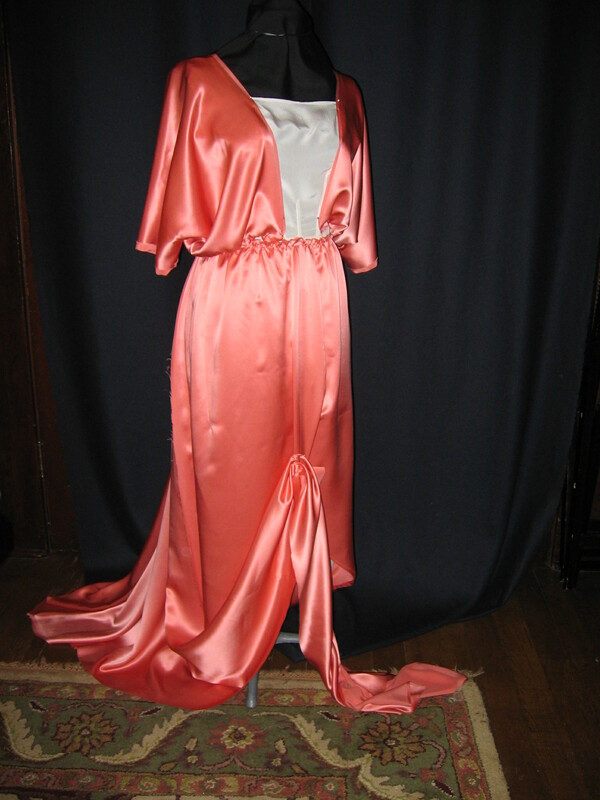 The seam lines were copied from the original, but using the client’s measurements for the new gown. Like the dressmakers and modistes of 100 years ago, I used boning in the seams and at the center front to keep the dress from shifting or rolling up while it’s being worn. Once I knew that the lining would fit correctly, it was time apply the next layer: the underskirt. 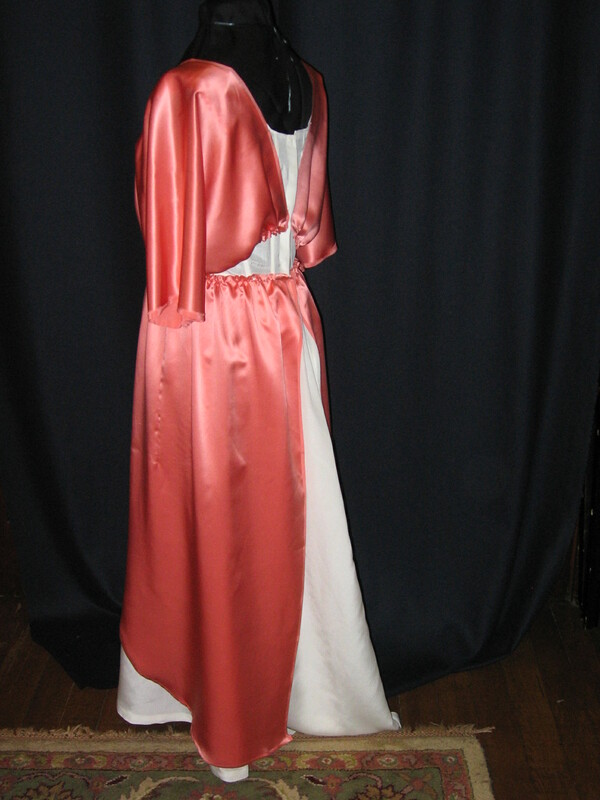 I used white silk here, as well, since the original gown had a silk underskirt. The shape of the skirt followed the 1912 lines: smooth over the front, with the extra fullness pleated into the center back. The underskirt was sewn to the lining by hand, just as we found in the original. This gives the sewist more control over placement, a flatter seam, and a safe way to sew past the metal boning, which was already in place in those seam lines. 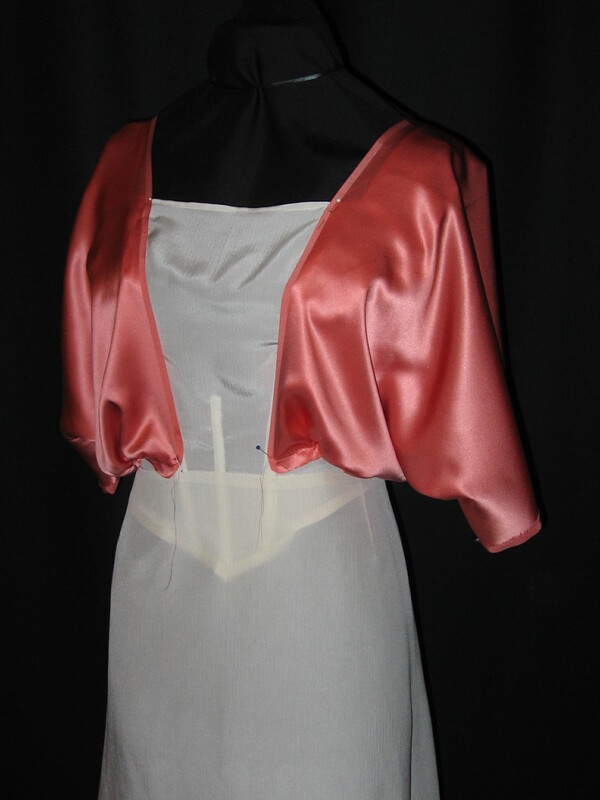 The next step was to drape the bodice sections. 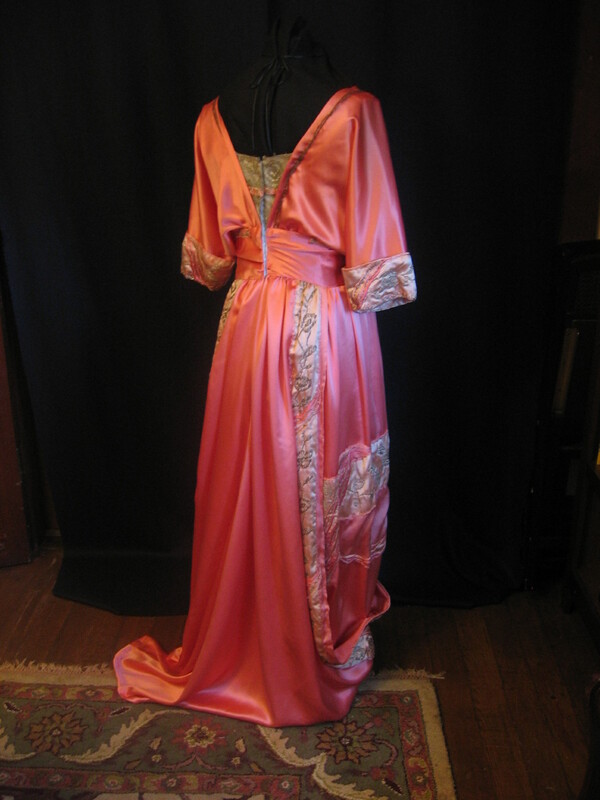 We had chosen silk charmeuse in a glorious coral color, similar to the 1912 fabric, but without the soft crinkled texture. Given our time and budget constraints, we had also decided not to copy the hand embroidered sections on the bodice. 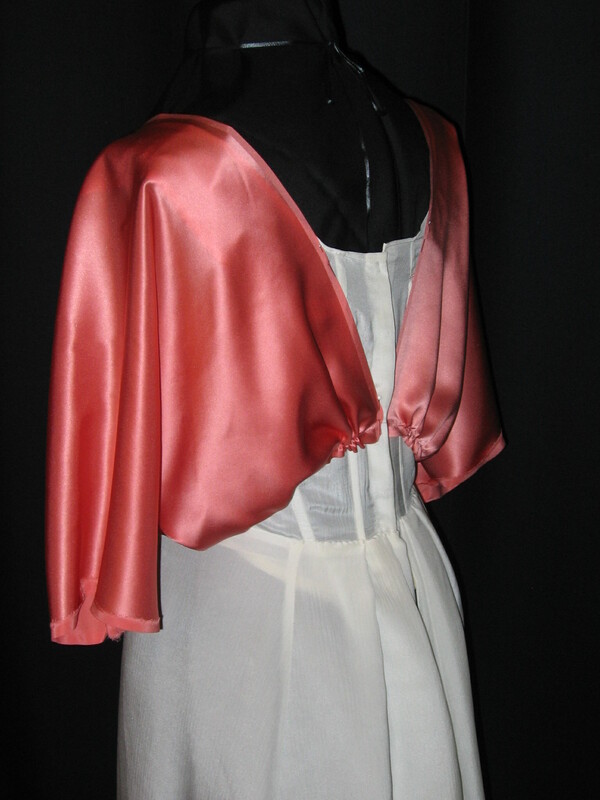 We created a draped bodice with the kimono sleeves, but without the gusset detail or embroidery. The original skirt had been made in sections; so was ours. This section would have the embroidered antique bands attached along the curved edges. Like the original, this skirt layer was open in the back. 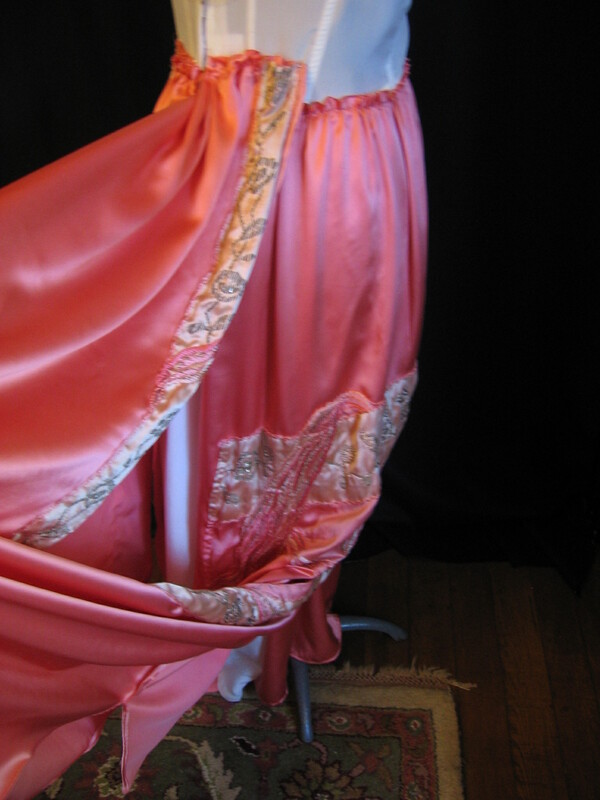 The overskirt drape would cover the selvedge edges. The draped section had to be exactly long enough to carry the antique bands. In addition, it needed to gracefully span the gap between the center back and center front openings. I experimented with the placement to find the “just right” proportions. The original underskirt facing was long gone, possibly removed by a previous owner for an art or home decorating project. 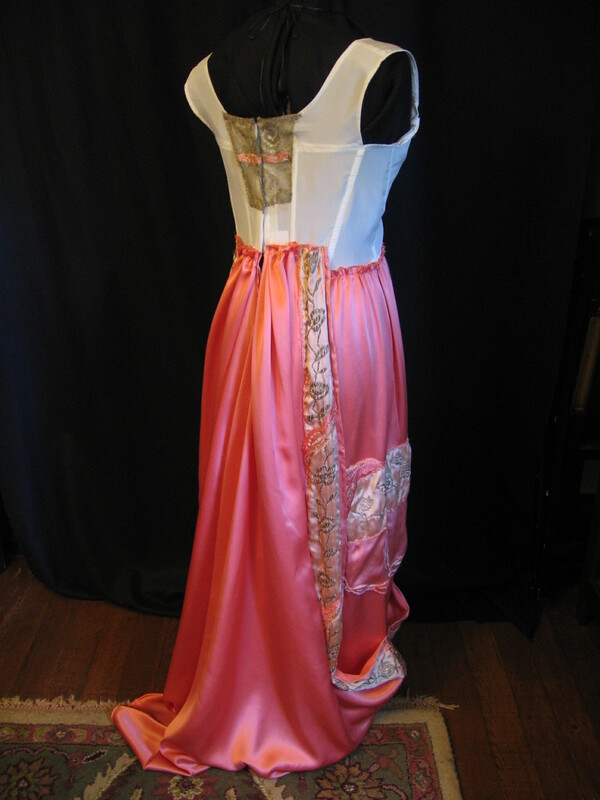 Rather than try to recreate it, we chose to cover the underskirt section with matching silk charmeuse. This would also be sewn in place by hand. 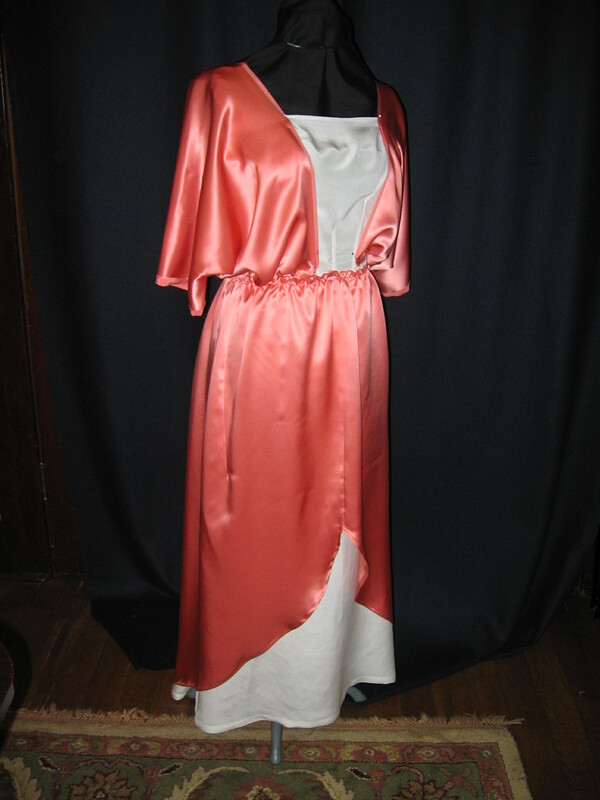 Now we had the basic gown made up in new fabric. It was time to incorporate the antique sections that we had been able to save. I had sewn the embroidered bands onto the main skirt by hand before pinning it to the form. I gained a deep appreciation for the detailed artistic embroidery that those long-ago modistes had done! 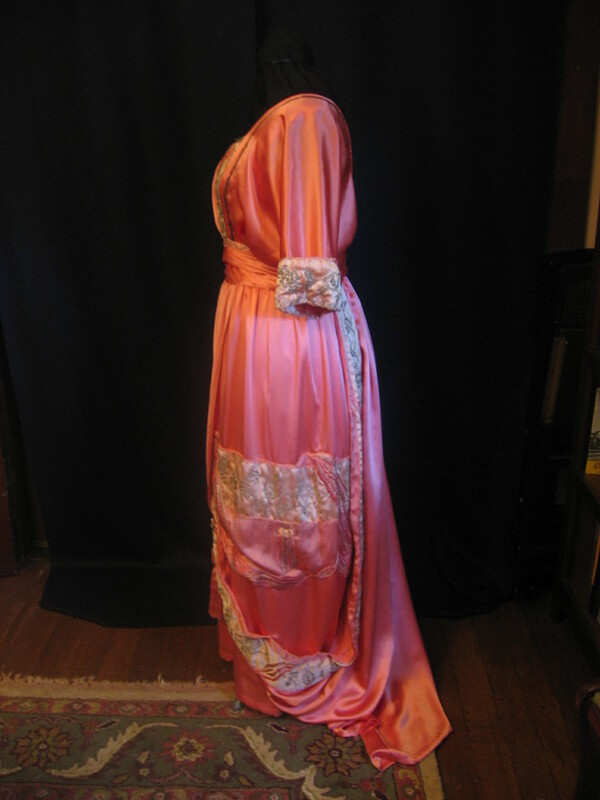 The overskirt drapery was mounted to the lining slightly above the natural waist. The sash would cover the last of the lining and all the hand stitched sections. 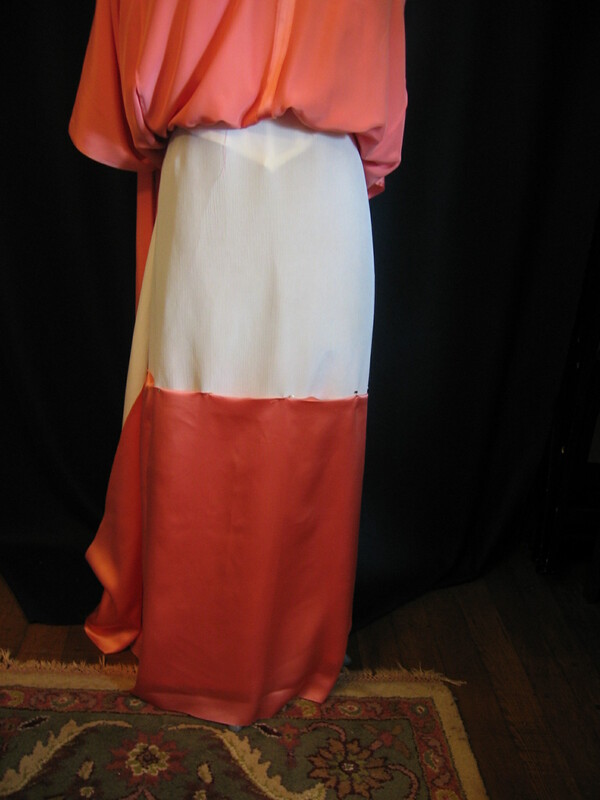 Here I have recreated the draping of the original skirt layers. The top layer would be tacked in strategic areas as the original was, but for the most part, the draped skirt stays in place because of its weight and the clever design. 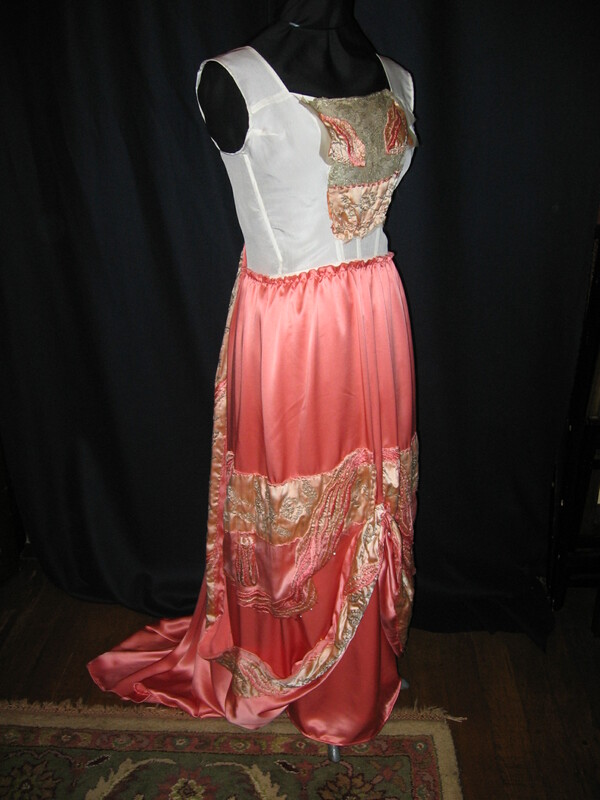 It is rare to be able to examine a Paris designer gown like this one; it is even more unusual to be asked to take it apart! Normally, I would prefer to keep the entire original intact for future study. In this case, though, with the original starting to break apart and some of it already removed, it had already lost much of its value as an antique. I am glad that I was able to document its deconstruction and the reconstruction, and that I could share it with you. Oh my what a job! I would be trembling in my boots if asked to do a job like that. What a gorgeous garment it was and now thanks to you, it lives again. Loved all the documentation you did for this. 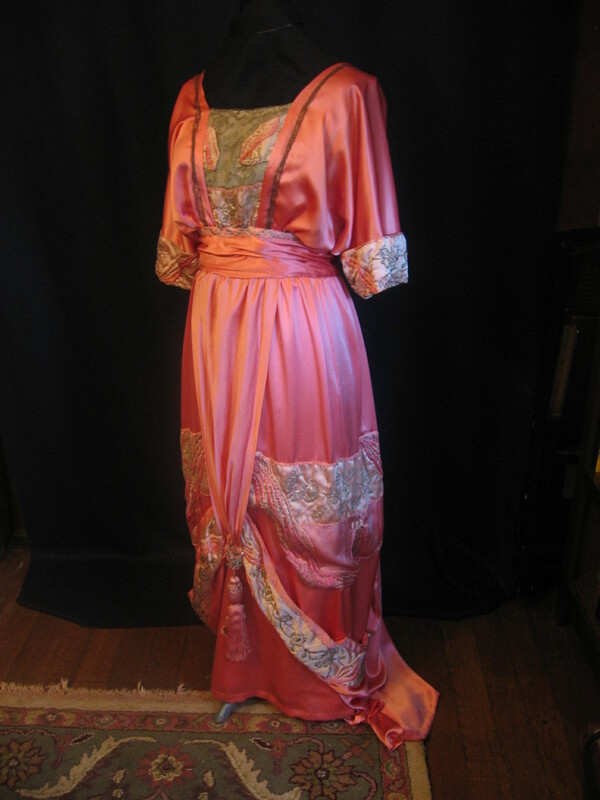 I am glad I discovered your blog as I am venturing into making a “living history” outfit and the early 1900’s to 1915 is going to be my making history timeline. 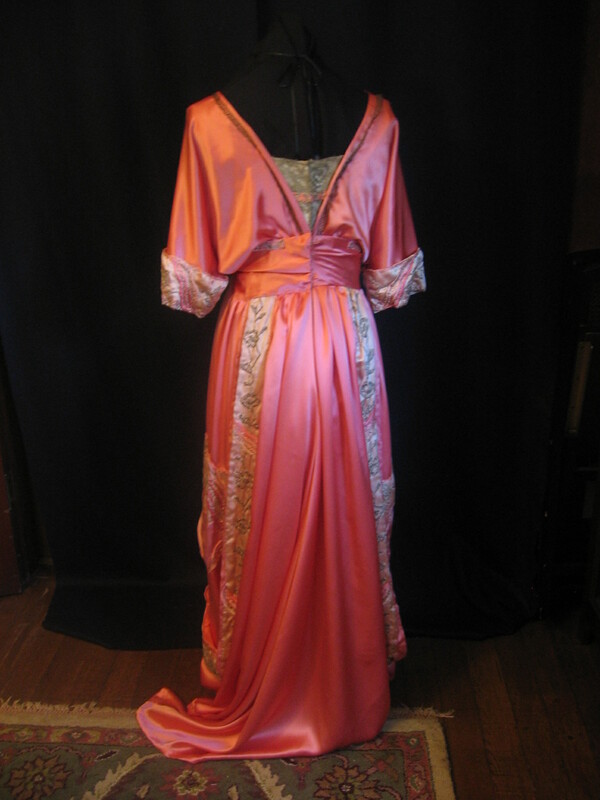 Finding out old couture ways is fascinating. Looking forward to seeing more techniques that you care to post. Thanks from Canada.